Are you providing unpaid assistance to a spouse, relative, or friend who is ill, disabled, or needs help with basic activities of daily living? Do you help with rides to the doctor, shopping, meals, bill paying, bathing, grooming, dressing, walking or transferring to a wheelchair, housekeeping, managing medications, or arranging services to be provided by others? If you provide services like these, whether or not you live with the person you are helping, you are a caregiver. Caregiving is important work and it can be rewarding, but it can also be overwhelming. You are not alone. An estimated 679,000 Minnesotans are caregiving for an older or disabled adult. Don’t struggle alone with your caregiving responsibilities. More help is available than you may realize. Discover the many resources available in your area by visiting www.minnesotahelp.info® or calling the Senior LinkAge Line®: Link to a Local Aging Expert, at 1-800-333-2433. The Minnesota Board on Aging, in partnership with the Area Agency on Agings and Twin Cities Public Television (TPT), developed Caregiving: A Part of Our Culture: an online series to raise awareness of caregiving and offer tips and resources for ethnic and new immigrant caregivers. This information is translated into four languages (Somali, SPanish, Hmong an Khmer), and is available in multiple formats to organizations statewide. 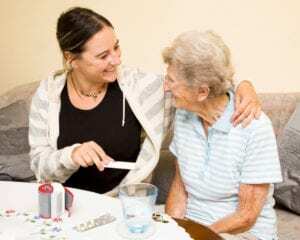 To learn more about Caregiving: A Part of Our Culture, watch videos and download Caregiver Tip Sheets and Resources, visit Twin Cities Public Television’s website.